Improve your performance on the field with the perfect training tool for any athlete. 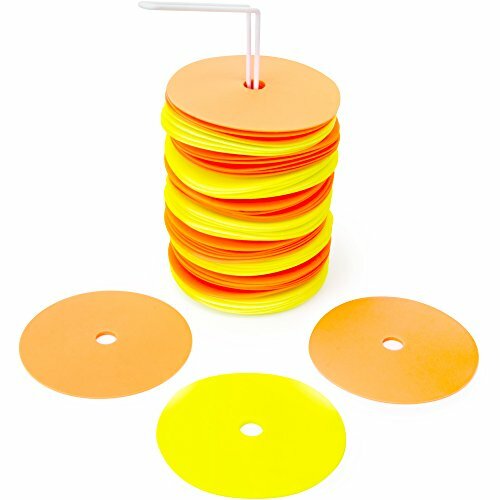 Each set of spot markers comes with 50 fluorescent discs for high visibility on any surface: 25 yellow and 25 orange. Use the colors to set up a variety of drill stations, establish boundary lines, or mix up the colors on the field. Alternative to traditional cones, these floor spot markers lay flat to the ground and measure 6" wide. Made from durable, non-skid rubber, these markers will stay in place on any hard surface so you don't have to worry about players tripping or slipping if they make contact. When practice is over, simply place each marker on the metal stand and store them away anywhere. If you coach or play a sport, markers are a must-have piece of equipment. They're essential for improving agility in athletes of any sport: basketball, football, soccer, baseball, lacrosse, track, and more. These flat spot markers are the perfect alternative to traditional cones and easier to store. With so many markers in two different colors, you can create multiple drills at once or establish clear boundary lines for a pickup game. Their rubber materials can withstand indoor and outdoor practices, so you can use these for any athletic season.